Every goal in the Indian Super League (ISL) is met with a burst of firecrackers from the sidelines. The consequences of such revelry is clearly evident. The smell of gunpowder lingers in the air for a long while after the goal, and it's a wonder the players don't smell it, or even if they do, are not perturbed by it. Maybe this is their way to protest. Playing out dull stalemates. There were no firecrackers at the Marina Arena on Saturday. Kerala Blasters FC and Chennaiyin FC were kind enough to not score and hence, unleash the nauseating smell of gunpowder on the spectators, a day before Diwali. The two teams ensured there was one more day of 'clean' air, before it becomes unavoidable on the big day itself. In all seriousness, this was an unbelievably dull game of football, and not because of a lack of action. There was action aplenty, but very little of any significance. 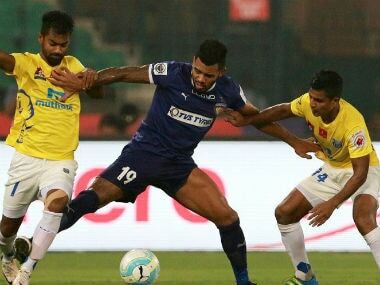 The best action came after the final whistle, a disagreement between Kerala Blasters' Kervens Belfort and Chennaiyin's Manuele Blasi prompting a scuffle between the players. 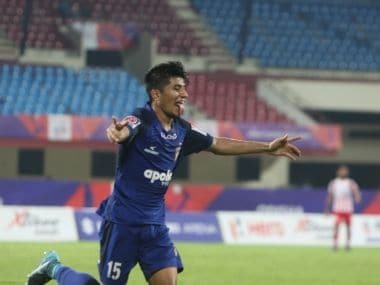 This was Kerala's best performance at the Marina Arena – sure they won their semi-final on aggregate in the opening season here, but were hammered 1-3 by Chennaiyin FC that night, and it was only a 3-0 win in the first leg and a crucial away goal that allowed them the ticket to the final. 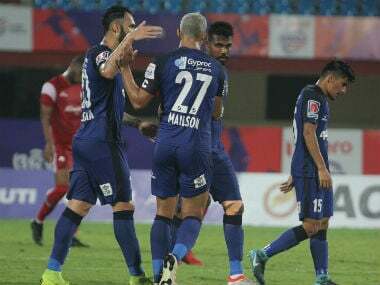 However, it could have been worse for Kerala at the Marina Arena in the ISL 2014 semi-final, and even coach Steve Coppell accepted after Saturday's match that it was the best show that Kerala could put up at the ground. Kerala were appalling in the first half, a pale shadow of the team that had dismantled FC Goa with verve and speed in attack in their previous outing. Here they were, booting balls upfront to no one in particular, and the deep back line not helping their cause. The four men at the back looked stranded more often than not, but also looked very happy being on their own. The gap between them and the midfield was immense, and not just spatially. There was a time, not too long ago, when Michael Chopra was the lynchpin of this side. His deep incursions to pick up the ball and link up play were the key to the team's attacking intent. Kerala are now on a five-match unbeaten run, they have won two and drawn three, and now, Chopra's lack of pace is showing. He was injured in the match against Goa, dropping down with a pulled hamstring a little over 10 minutes from the end. It could have been the effects of that injury that his performance on Saturday was lumbered. He looked a bit lost when he didn't have the ball, unsure of what he was doing so deep. When he got hold of the ball, on the other hand, he was hustled off it too easily. Chennaiyin's midfield did a fine job and nullified the threat posed by Chopra and his team. 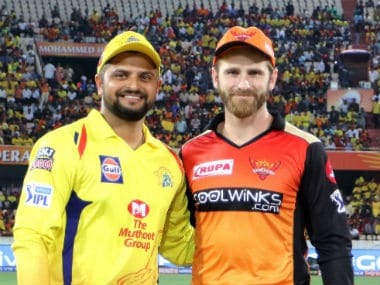 They did everything they could to hassle Kerala in the first half, and if it weren't for Hans Mulder's injury and subsequent substitution, they would've continued doing so for the rest of the match. That first half must have irritated Coppell no end. Kerala had more possession, and were passing the ball nicely albeit a lot sideways. But they had nothing to show for it. Zero shots on goal. Zero goals. Unsurprisingly, the moment Kerala got inventive and decidedly more attacking, the match opened up. The back line pushed up a bit, and now instead of Chopra, it was Mehtab Hossain linking up play. Chopra came off, and on came Didier Boris Kadio. His first contribution was at the edge of the circle, where he took a first-time shot. Perhaps a touch wouldn't have been out of order. Still, at least Kerala were now shooting on goal. If you had offered Coppell a point and a clean sheet from this match earlier in the season, he would've shook your right hand and snatched the offer with his left. But this is crunch time; half the season almost gone and while there is no harm with one point, this was Kerala's chance to hit the top of the table. Chennaiyin didn't play with the solidity expected of defending champions. They were uncertain and vulnerable. In the second half, they were outnumbered and even outmuscled in the midfield, their best chances more the product of defensive lapses by the opposition than their own creative ingenuity. But Kerala weren't better either. Their two attempts on target (from a total of eight shots on goal) were by Duckens Nazon, a man who came on in the final 10 minutes. Worse, they couldn't have been easier for Karanjit Singh to save. There's an advertisement around the ISL that airs on TV. It says 'games are won by scoring goals, but they are also won by stopping them'. Kerala shouldn't take that ad to heart. You cannot win if you don't score. You can draw, but you certainly cannot win. Kerala had scored in their last three matches, and won two of them. This has been a season low on goals – 49 in 26 matches (at this stage last season, 66 goals had been scored) - but no one has had it worse than Kerala. They have scored four goals. That's it. Kerala may be on an unbeaten streak, but if you don't win, you don't win. And no, a draw away from home isn't a win.